Impossible to forget, traumatic to recall. I don’t know why they bothered. This is three years’ additional ageing, pretty much wasted. It’s Don Papa 7 version 2.0, and just about the whole experience is the same, except the raspberries from the younger variation, which are now dark grapes. Everything else – and I mean everything else, mouthfeel, taste, finish, smell, the works – remains the same, without even some additional oakiness or complexity to make the extra expense worth it. If so, they were mistaken. Even bumping it up to 43% for some added bola ng bakal didn’t do much. It had the same nasal profile of sour cream, yogurt, some sweetish fruits, and over-generous helpings of vanilla, bubble gum and yes, there it was again, that distasteful excess of soda pop sprite and fanta and pepsi masquerading as “rumminess”. And no tart raspberries this time, but some dampened down dark grapes, overripe ones, plus a twist of licorice. Oh joy. My glass runneth over. By now you should have few illusions left: the palate offered no redemption, leading any reasonable tippler to ask in genuine bewilderment, “What on earth was the rum doing for three additional years?” I mean sure, there was some bite and bitter in the mix (which initially gave me hope), just too little. And the few aromas of peaches and cream were bludgeoned into insensibility in labba time by wave upon wave of more vanilla, soda pop, the syrup in canned peaches (minus the peaches), cola…it was all just too much, too sweet, too cloying, and with few discernible differences from its younger sibling, and a finish that was to all intents and purposes the best thing about it, because at least now the experience was drawing to a close. You know, if they had honestly called it a spiced or flavoured rum I would have nodded, smiled, passed it by and never bothered to write a thing. But they didn’t…and so I did. 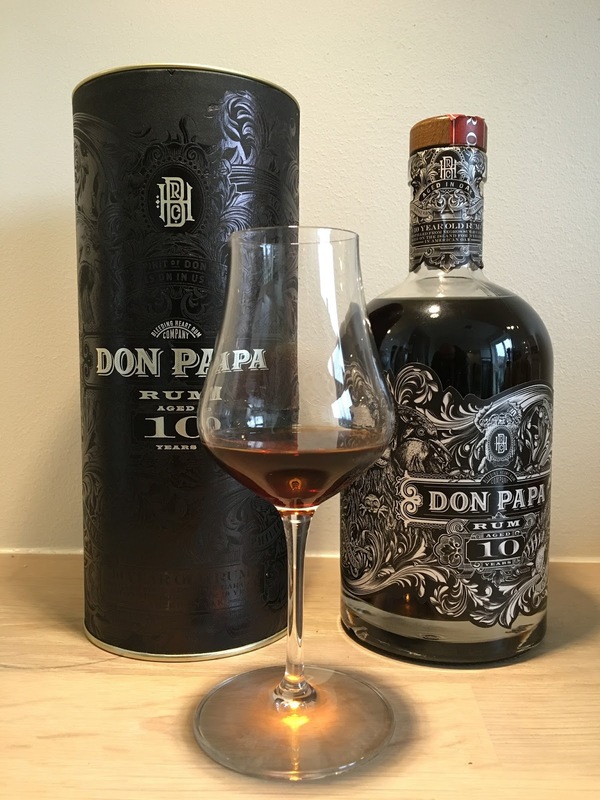 And my evaluation is simply that Don Papa 10 is a hollow rum. Age or no age, it’s column still industrial spirit that’s been tarted up, where no such embellishment was required if they took some time and care and blending mastery to the task. It takes its place proudly with the Whaler’s, Kraken and Pyrat’s XO and the AH Riise Navy 57% on the bottom of any reviewer’s shelf, and with good reason — it’ll get you drunk no problem, and at a reasonable price, but if you wake up the next morning wondering what camel voided its bowels in your mouth and why you have a tattoo of “Don Papa” on your left buttock in hieroglyphs, don’t come crying saying I and all the others didn’t warn you. It gives me no pleasure to write reviews like this. Oh the words flow easily, the rum really isn’t worth it and I can stand by the opinion. I just don’t understand why, in this day and age, I should have to. We’ve been hearing for years how rum is in its new golden age. So why would anyone who loves rum enough to actually make one, create something that is so clearly not? In my more generous moments, I say it’s because they want to make what sells to the tippling masses and will do better as their skills improve; in my blacker moods, I think it’s a full-proof money grab adulterated with the cloying additive of indifference. Compliments to Henrik of RumCorner, who provided both a large sample and the photo. For an enthusiastic and uncritical perspective by a “lifestyle writer” (I will not use the term “journalist” because that would be like saying Don Papa is a real rum) I direct you to this Forbes article from May 2017. It’s just another in a spate of recent rum-themed articles that are written by people who seem to want to advertise that they really know nothing at all about the subject. Wow! I can safely pass this one by if it ever shows up in Ontario. I just saw your updated side note regarding the Forbes article. I got in touch with the author of the piece. I informed her of the adulteration of Don Papa and she claimed she would get back to me. Nothing else happened since.